Three Prong Outlet Vs Four Prong Cord – Belco Inc. If you own a home that was built prior to the mid 90’s and have had to replace your electric clothes dryer or range, you have most likely run into the dilemma of how to plug a 4-prong cord into an existing 3-prong outlet. Can the cord on the appliance be changed or do you have to replace the outlet in the wall, or worse yet….do you need to add an entirely new circuit from the breaker panel? Let not your heart be troubled! It’s really a very simple fix. 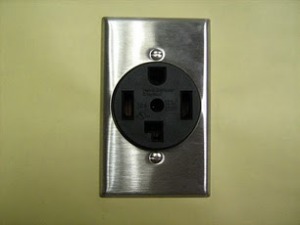 In residences built before 1996, the National Electric Code (NEC) required only a 3-prong outlet for electric dryers and ranges. As safety requirements became more stringent, the NEC began requiring a 4-prong outlet for new installations of circuits that provide power to these appliances. For new homes under construction, or for existing homes that convert from gas appliances to electric appliances, it is now required to install the 4-prong outlets. The reason for this is safety. 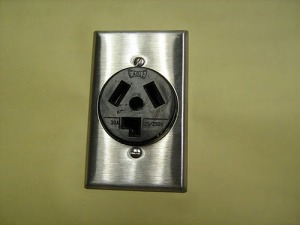 The older 3-prong outlets connected the neutral and ground wires together. This opened up the possibility of current flowing on to the ground wire and could lead to the metal frame of the stove or dryer becoming energized. If this happened, the result could be a shock delivered to the user when touching the appliance. So what is a person to do when they get home and find that their new appliance won’t fit the old outlet on their wall? You simply replace the appliance cord. Most retailers that deal in appliances, and even many big box retailers sell replacement cords for dryers and stoves. When the NEC mandated 4-wire outlets in new homes, it also realized that it may be too costly and invasive for many home owners to replace the old wall outlet with a new 4-prong outlet and replace the wire inside the walls to upgrade to the new 4-wire system. Therefore, it is code compliant to continue to use your existing 3-prong outlet, and simply replace the 4-prong cord on the appliance with a 3-prong cord that matches your existing outlet. The connections are very simple on the appliance and the screw terminals will usually have indications as to which wire connects where. You don’t have to re-wire your kitchen or laundry room to upgrade to the newer, more modern and efficient appliances that make life better. All you need is a little planning to make sure you come home with the proper cord to match your outlet and you are on your way! If we can help you, or if you are not sure that your existing outlet is safe, give us a call at 770-455-4556, or you can find us on the web at www.belcoinc.com. We are ready to assist you any time you need us! Simple and to the point. Great information, thanks! what if your appliance has the 3 prong cord and the house has the new 4 prong outlet. Can you still just replace the cord? is there an adapter? I changed out my old Kenmore dryer for a 4 prong plug when I was renting. Of course the house I just bought has a 3 prong outlet and I threw out old 3 prong plug. Never fails the piece you don’t keep us the one you need! My house was built in 1999. The stove is the original. which I am now replacing with an Induction Range. I am receiving conflicting reports as to what I need to do. I assume I have a 3 prong plug on my 1999 range. Do I require an electrician to install an entire new wire to my electric box (220/240) and a 4 prong plug or does only a 4-prong replacement plug do the trick? I look forward to your reply…Many thanks! In 1999, the circuit installed for an electric stove should have been 240volt and 4 wire with a 4 prong receptacle. I would expect that you already have the 4 wire receptacle in place. If you do not have the 4-wire receptacle and currently have a 3-wire receptacle, I would have an electrician come out to check the situation. It may be that the correct 4-wire circuit was pulled but someone put a 3 wire receptacle on to match an existing cord on the current range. If that is the case, you would need to replace the 3 wire receptacle with the correct 4 wire receptacle. Attention: Consumer Product Safety Commission (CPSC) issues update regarding... Reduce Electric Bills By Cleaning Up That Crawlspace!